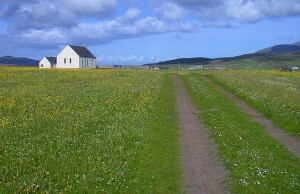 Howmore Church approached from the seashore track. The website WalkHighlands gives details of a one hour tour on foot of the attractions at Howmore. It takes in the church, beach, machair, thatched cottages, four ruins of ecclesiastical buildings and the hostel. Compared with the more arduous hill-walking nearby, this is like walking on air and is to be … recommended.